I’m excited about the opportunity to be a Homestead National Monument of America Artist-in-Residence later this year. It allows me to experience the site for several weeks and see what kind of work evolves from it. My ancestors were farmers in Missouri. How they acquired their land, for now, is a mystery but I look forward to learning more about those who homesteaded. Homestead National Monument of America is excited to announce the artists chosen for the 2019 Artist-in-Residence program. This is Homestead’s eleventh year offering artists the opportunity to live at the monument and create works of art inspired by the Homestead story and its environment. Homestead is just one of many National Park Service sites that host resident artists to help connect visitors with the park’s meanings using a variety of art forms. Plan to visit the monument this spring through fall to interact with this year’s Artists-in-Residence while they work and create. “The Artist-in-Residence program is extremely valuable. It gives park visitors an opportunity to not just see Homestead and its story themselves, but see it through the eyes of the artist, which can be very moving and powerful,” stated monument’s Superintendent Mark Engler. Homestead National Monument of America is a unit of the National Park Service located four miles west of Beatrice, Nebraska and 45 miles south of Lincoln. Hours of operation are 8:30 a.m. to 5 p.m. Monday through Friday, and 9 a.m. to 5 p.m. Saturday and Sunday. Admission is free of charge. For additional information, please call 402-223-3514 or visit http://www.nps.gov/home/. There a lovely synchronicity when two lovers leave their mortal coils nearly together. Jack Ozegovic died on a December Saturday and Ann Carlin Ozegovic died the following Monday. Both were wicked smart, active, inquisitive, funny, social, opinionated but good listeners and wonderful artists. Their home was welcoming and their frequent gatherings were salons where you met interesting folks, discussed ideas amidst gorgeous art with a spread of delicious food on the table. Jack and Ann had an amazing cadre of friends who, at the end, stepped up to help them keep the faith that health would return, and once that was no longer possible, those same friends supported Jack and Ann on their journey out. No longer will we see Ann out exercising, registering voters, singing in the choir or Jack calling to say they’re celebrating Tito’s birthday or to announce a meeting of his Men’s Intellectual Improvement Group. Many of us will miss them dearly. I painted this oil of Jack and Ann Carlin Ozegovic about 20 years ago. My work was shown in the summer of 2018 Hannibal, Missouri’s Hannibal Arts Council exhibit space. My co-exhibitors were delightful St. Louis artists, Ben Bradshaw, ceramist, and Bryan Payne, doodler and found object seeker. Their careers will be worth following. Show announcement above designed by Laura Zimney. The Hannibal Arts Council designed the show announcement below. Thanks to the sponsors. Women standing up for their rights. The two young women toasting their right to vote in the bottom painting are the same women who joined several million folks around the world to protest the proposed rollback of hard fought rights for women and for the environment with the 2016 elections. The national movement to gain women the right to vote took 72 years. You can learn more about it here. George Paley died this week. What joy he brought to his friendships. Encouraging, always curious, he loved sharing his ideas and projects with others. You could join him in the journey or not. While exhibiting casualness and a wry sense of humor, he brought a vital energy and creativity to his endeavors. His efforts were full throttle forward. Many will miss George terribly, but will take a deep breath to shrink the lump in our throats, and be grateful for his love and his friendship. This is a link to Joanna Hlavacek’s lovely tribute to George and Judy in our local paper. Yesterday a friend updated a group on Sally’s health status, so I knew she was in hospice. But upon hearing of her passing, a somber cloud settled around me. Now her delightful presence and fun company will be only a memory. Described as a force, Sally was willing to jump headlong into whatever project captured her imagination. She was a skilled artist who produced superb work; strong, beautiful prints. One of the reasons I love and will always admire Sally, is the way she made me feel about myself and my work. She lifted my spirit with her attitude. I bet she’s pissed about dying before she was ready and, frankly, I’m a little pissed too. Sally’s work can be seen here. Dennis Dutton, an arts philosopher, presents this Ted Talk on understanding beauty. His proposition is that beauty isn’t cultural or in the eye of the beholder, but a gift from our ancestors handed down through a million years. Beauty is an evolutionary gift that aids our survival. 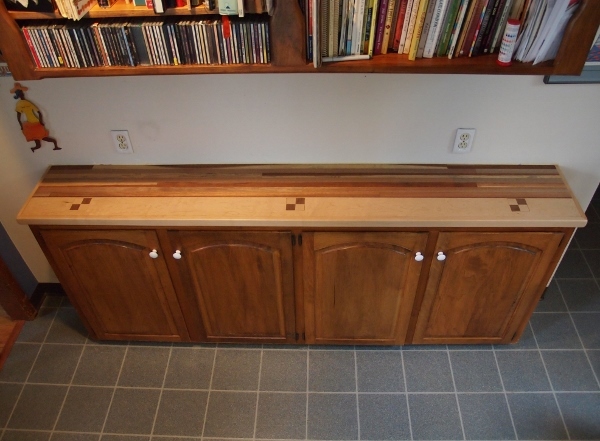 Mixed hardwoods; mahogany, walnut and maple. Inlays are maple and walnut. This is one of four wooden counter tops that I’m building with the guidance of Jay Hindley, the ever patient and knowledgeable instructor in my woodworking class. 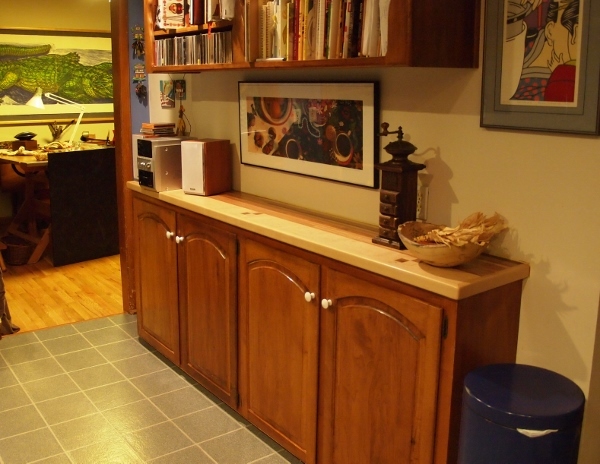 The wood is recycled hardwood semi-truck flooring and the maple was once a gym bench. A small amount of trim work is still to be done, but I’m so pleased with the results, I’m posting. 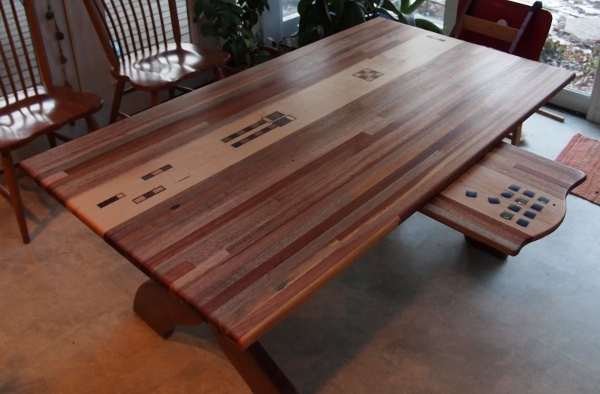 Another post shows a dining room table using the same materials. That table began as a counter top, but after deciding not to use wood around the sink, it was redesigned and now sits in the Zimney dining room. 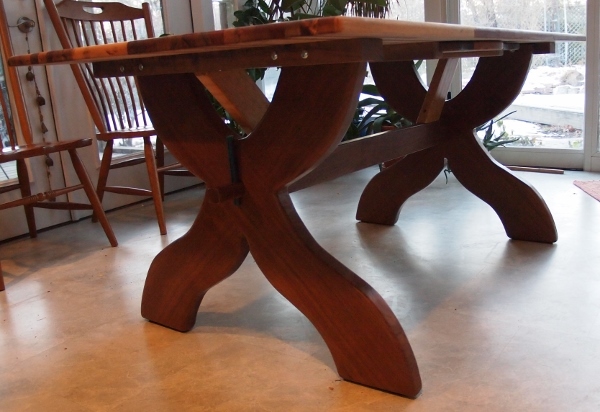 This dining room table follows the American folk tradition and is called a Sawbuck Table. The legs and rail are walnut while the braces are maple. 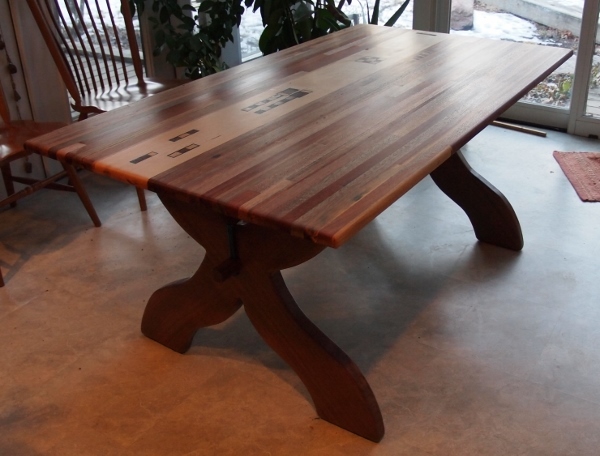 The table top is re-purposed wood; the maple was once a gym bench in a high school locker room and the mixed hardwood, some Brazilian, was once the flooring of a semi-truck. The inlays are maple and walnut edged in colored ink. The rail pins are stained with the same color of ink. 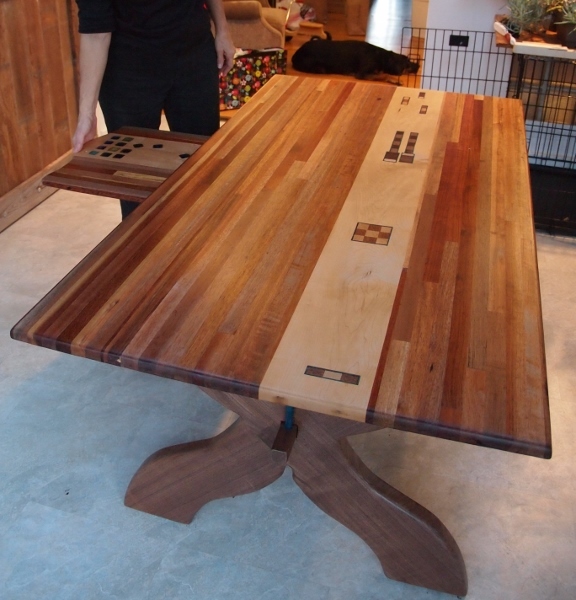 The serving board which slides under the table top, is made of the same wood. 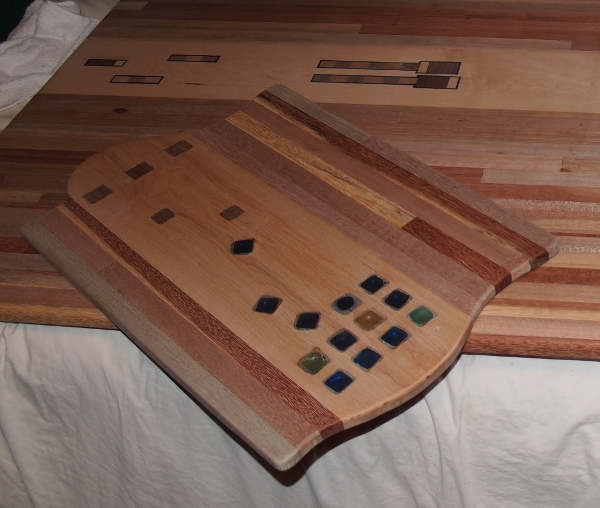 The colored glass inlay has an orderly pattern that appears to tumble and the inlay changes to wood.